Pricing shown is for a standard 44″ four-person diner booth set. Please call if you wish to purchase other sizes, or a custom size to fit your space perfectly! The Art Deco Diner Booth Set is an exclusive Retro Outlet design. This set is a fully upholstered booth with custom curved back design and an inserted V design in the booth back. The Art Deco Diner Booth is available in your choice of standard or designer vinyls and laminates. 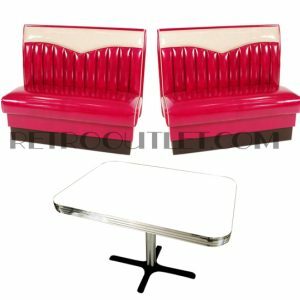 This Set is comprised of two 24″D x 36″H x 42″L diner benches with a matching 24″ x 42″ table with 1.25″ real metal banding and Classic Chrome Column “B” Base. Please allow 4-5 weeks for production of this set in your choice of vinyls.